REDDING, Calif. - Limited tickets are still available for a free community worship concert featuring Simpson University’s Music Department and Redding singer-songwriter Kristene DiMarco. 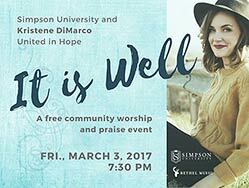 “It Is Well” will be at 7:30 p.m. Friday, March 3, inside the James M. Grant Student Life Center at Simpson University, 2211 College View Drive. Doors open at 6:30 p.m. for those with advance tickets, which can be reserved free online at simpsonu.edu/praise. The concert is a special collaboration between Simpson University choirs and DiMarco, who will sing traditional hymns from her latest CD, “Mighty,” including her 2014 rendition of “It Is Well,” which was released to radio in 2015 and is played in churches around the world. The first part of the evening will feature music by Simpson music students and faculty and the Women’s Choir. After intermission, the choirs will join DiMarco and her band for a collective worship experience. DiMarco and her husband live in Redding with their two children. In addition to “Mighty,” she also has albums titled “Those Who Dream” and “Safe Place.” She’s working on a new album for release in the fall. Simpson University’s Music Department offers bachelor’s degrees in composition, music education, performance, worship ministries, and music liberal arts. Award-winning faculty also direct vocal and instrumental ensembles, for students and members of the North State community. Learn more at simpsonu.edu/music. Sponsorship opportunities are also available for the concert. Contact Don Merrill at dmerrill@simpsonu.edu to learn more.